On a good day, it takes 12 hours by bus to get to Yushu from the provincial capital, Xining, which is itself about a 1,000-mile drive from the national capital of Beijing. As you climb south and west across the Qinghai-Tibet plateau, urban sprawl cedes to empty steppe. Just north of Tibet, the road opens into a small town tucked in a river valley. Its main street is lined with vendors selling yak butter and tea; its low, brown hills are lined with rows of brightly colored courtyard homes. Those homes  and the town  now lie in ruin. At 7:49 a.m. on Wednesday, a 7.1-magnitude earthquake shook the plateau, cracking a hospital, toppling schools and pulling mud and wood houses to the ground. At least 600 people were killed and 10,000 injured, according to state media reports. That toll will surely rise; many people, including children, remain trapped in the rubble. Footage from the scene shows rescuers digging through debris with their bare hands. 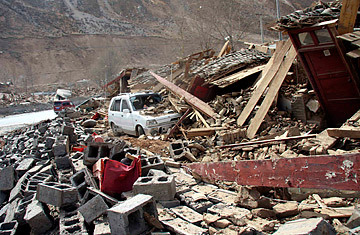 Beijing must now try to avoid rekindling the anger that grew in the wake of the cataclysm of two years ago, when a massive quake tore through neighboring Sichuan province, killing at least 87,000 people and leaving millions homeless. Then, as now, the majority of victims were killed in buildings that collapsed. Despite an estimated $250 billion recovery plan, allegations that faulty construction contributed to that death toll  particularly at the schools  have plagued China's government ever since. There is another factor at work here. Yushu sits at what was the edge of the old Chinese empire, and to this day its predominant population is not Han, the ethnic group that rules the new China, but Tibetan. Indeed, the name Yushu, or "Jade Tree," is not what the locals use, beautiful as it is. Yushu is Mandarin, the language of the bureaucrats of Beijing. The town uses Jyekundo, which is Tibetan  the language of the exiled Dalai Lama, a bête noire of the Chinese government. Dominating a large square in Yushu was a spectacular statue not of some cultural hero from the broad river plains, crowded cities or farmlands further east but of the great Gesar, a legendary king of the pastoral peoples of Tibet and Mongolia. No one knows if it survived the quake. The rescue effort will bring international attention to a side of China few see. Like much of the country's western regions, this rural county is relatively poor. The newly built Qinghai-Tibet railway runs 124 miles (200 km) to the north, whisking tourists and traders  and their money  directly to Lhasa, the capital of what the Chinese have demarcated as the Tibet Autonomous Region. (The Dalai Lama claims a larger territory for Tibet, including Qinghai province, where Yushu lies, and the Tibetans have their own name for Qinghai and parts of Sichuan province: Kham.) Yushu's villagers, monks and herders tend to be wary of the central government in Beijing. Many worry that the influx of Han Chinese migrants threatens Tibetan culture, and some consider China an occupying force. For now, relief efforts are proceeding  slowly. The road to the airport is damaged, forcing would-be rescuers to make the long journey over land. Downed phone lines, power outages and aftershocks have compounded the chaos, officials say. As darkness settles, officials are struggling to shelter survivors and treat the wounded. With tents, water and food in short supply, the people of Yushu/Jyekundo face many long, cold nights on the plateau.